They screech, strip leaves and bark in search of food, undo lamp post wires to swing on them, and they are up for a party any time! 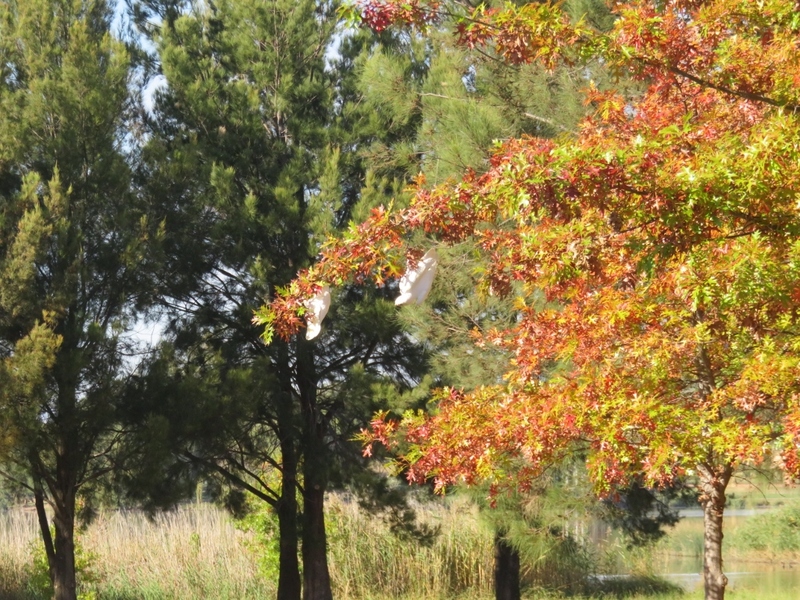 Sam Dooley from Bird Life Australia says ”they are extremely intelligent birds who are able to adapt and exploit new food resources” Corellas in Canberra (and elsewhere in Australia) have developed a penchant for the seed pods of the Liquidambar, and the Oak trees, traditionally northern hemisphere trees. They are destructive and entertaining in equal measure. 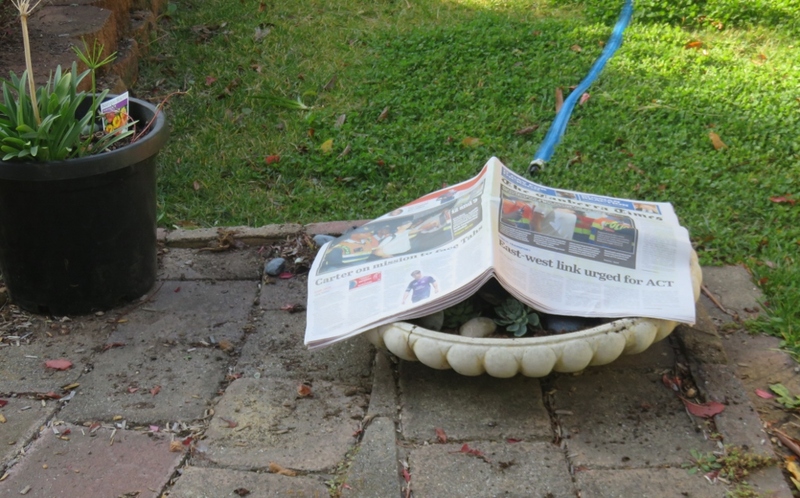 Well, just as long as they haven’t discovered our garden.. because look who’s coming…. 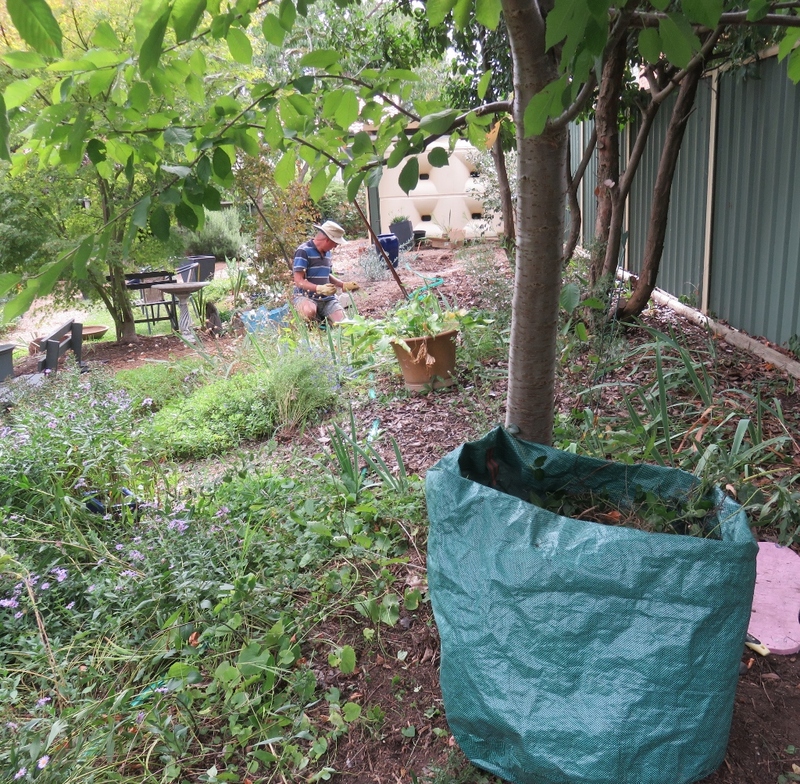 Meanwhile, Paul, who is just in the last stages of finishing his PhD, decided to clear about one quarter of the back garden, (he says it is a good counter balance to studying) . 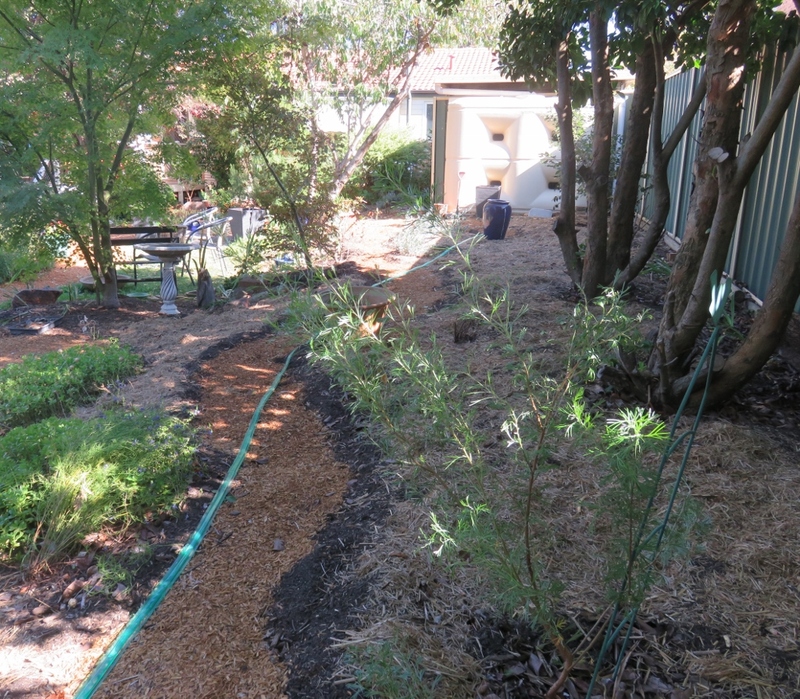 The plan is to change a very overgrown tired area, with a winding path and new plants along the borders. 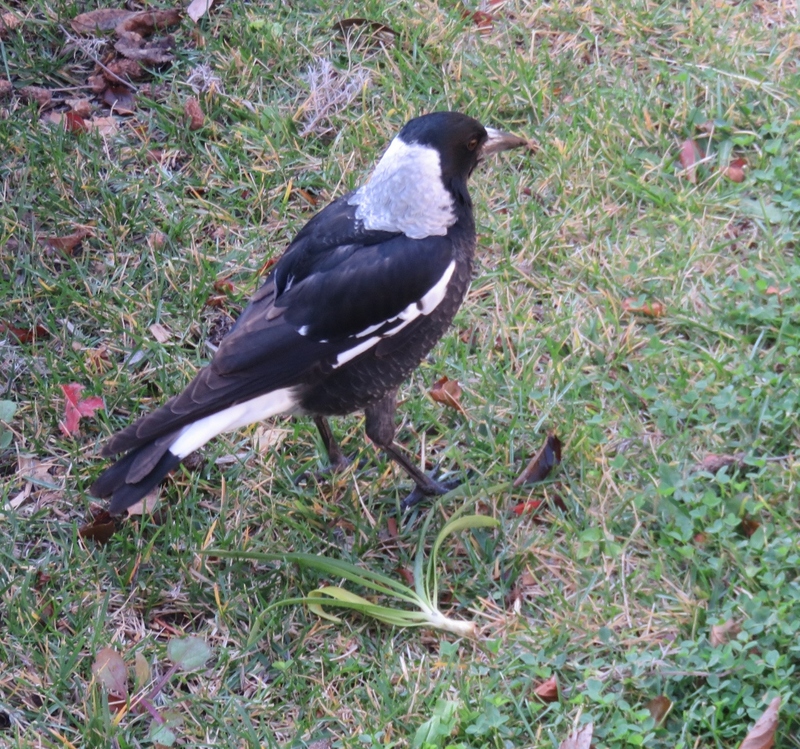 Magpies are very tame and great gardening companions….that is, if you are clearing, rather than planting.. 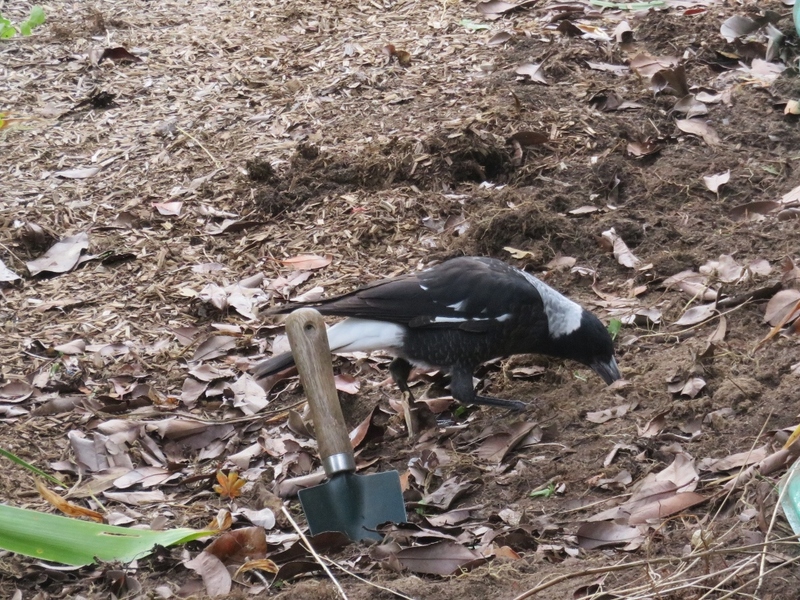 They dig away looking for grubs and take a great interest in the gardening routine.. as you can see they are very low key compared with Corellas. 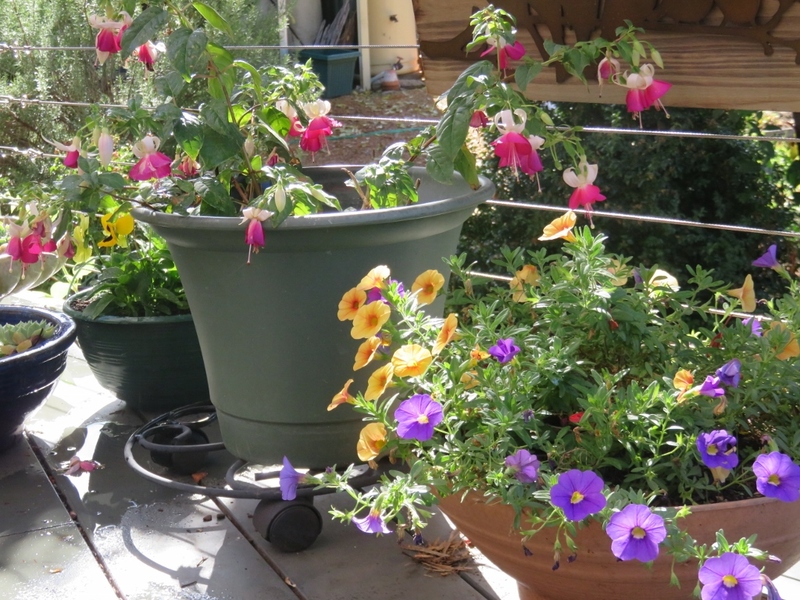 At the rear of the above photo is a water tank, it is attached to the carport roof, and rain water drains from the gutters into the tank… (we have a second much bigger tank near the house) These two tanks have provided enough rain water for most of the back garden this summer. 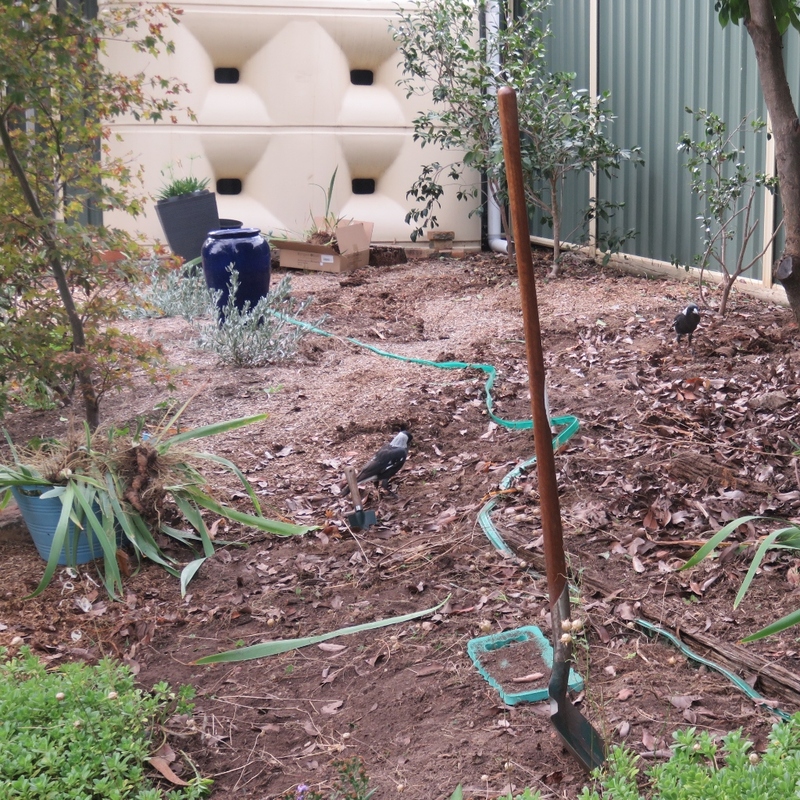 Here is Paul’s cleared border…looking great, and ready for new plants. 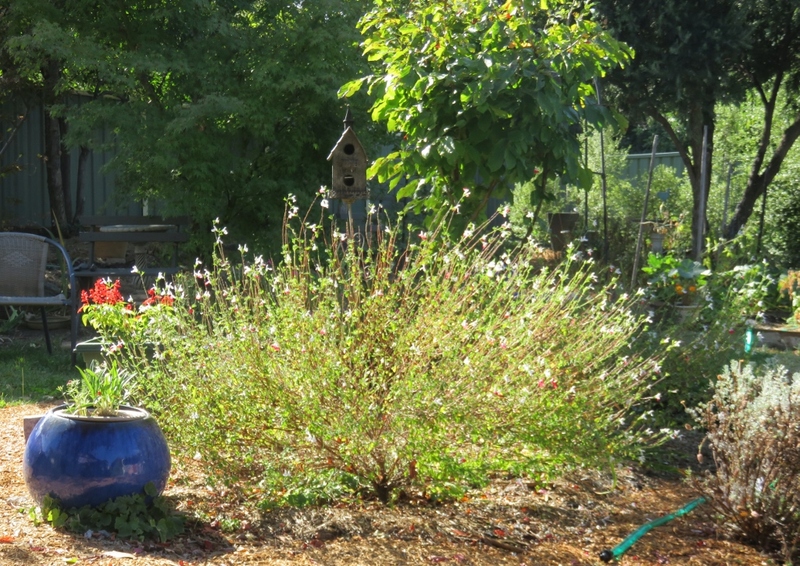 The Photinias on the right hand side will be trimmed right back at the end of May. 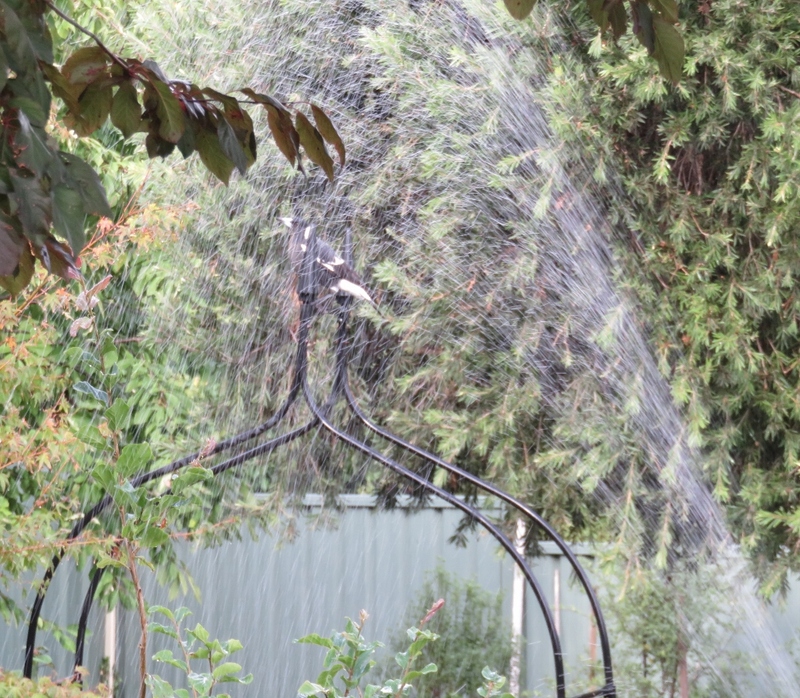 The magpie on the archway is really enjoying a shower, what could be better after a bit of companion gardening.. 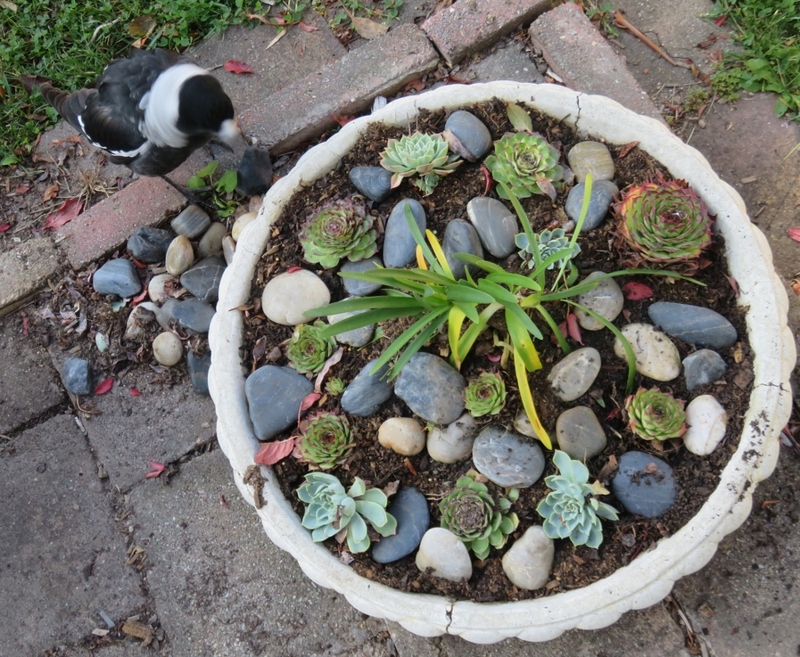 Meanwhile I had a much smaller project on hand…moving some of the succulents, which, after summer are spilling out of their pots. 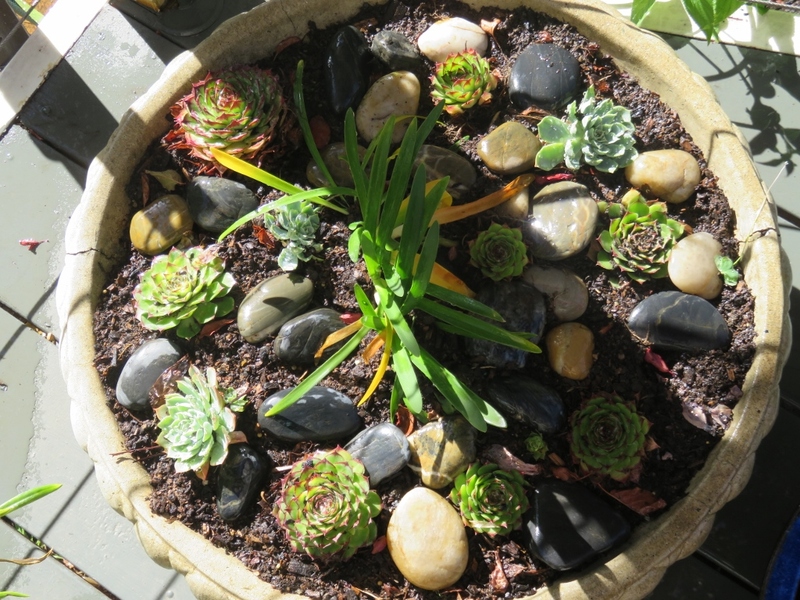 I put an ornamental white agapanthus in the middle of this old birdbath, and some succulents and pebbles around it. 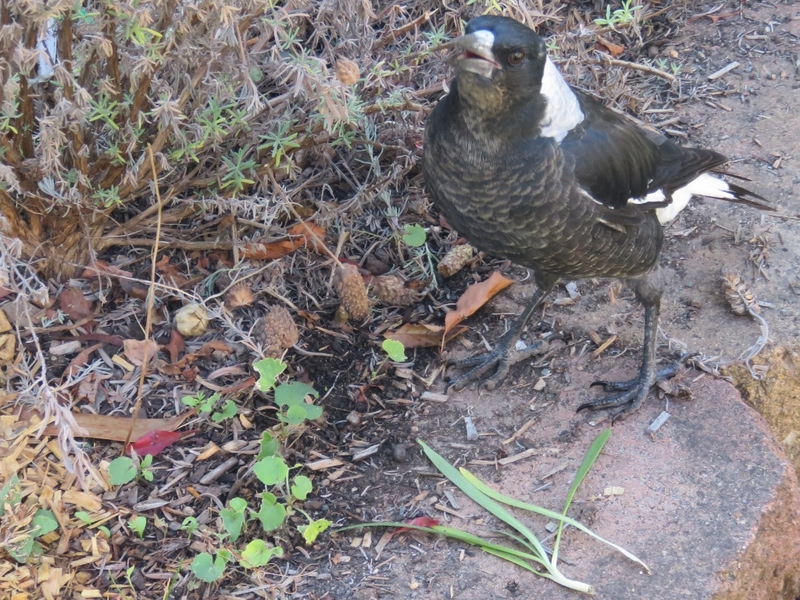 One of the younger magpies spent a bit of time watching me… as the Aussie saying goes.. she was having a ”stickybeak”. 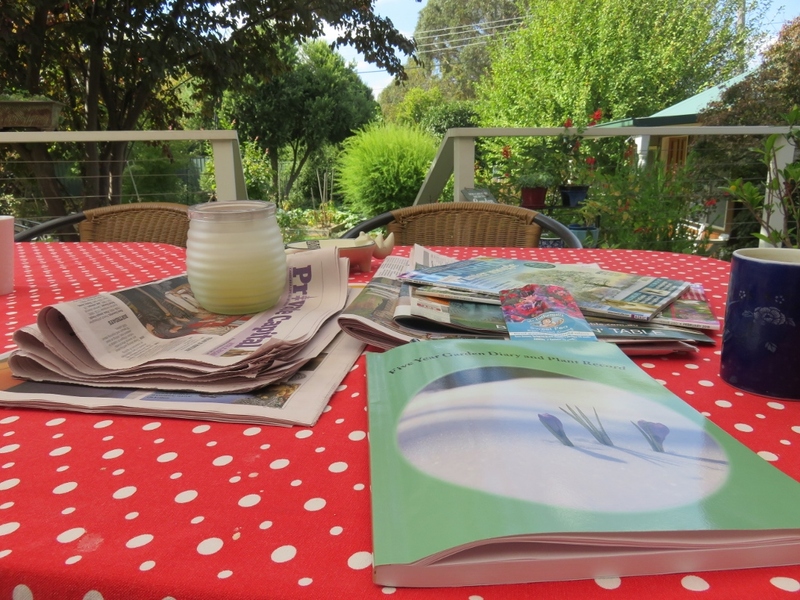 She is warbling at me (gently) here, to tell me that this is her territory..
and she looked so determined to try again that I resorted to putting the newspaper over the top of the new creation, while I finished writing in my diary. 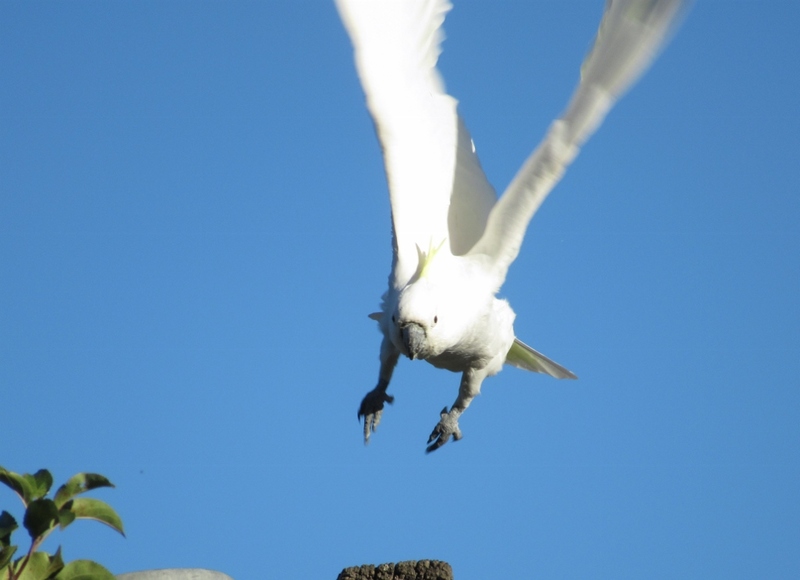 The things you do for birdlife…. 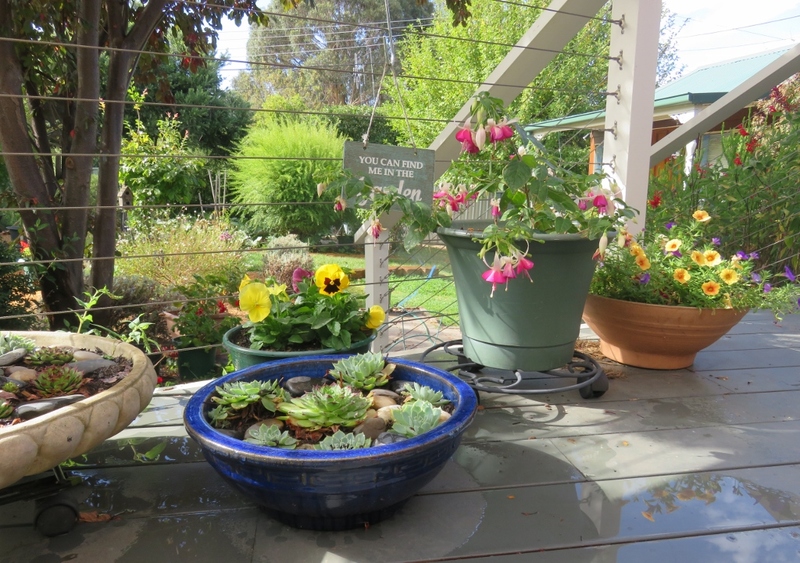 and all is well in the autumn garden..
….except for water….that most precious commodity for much of Australia. 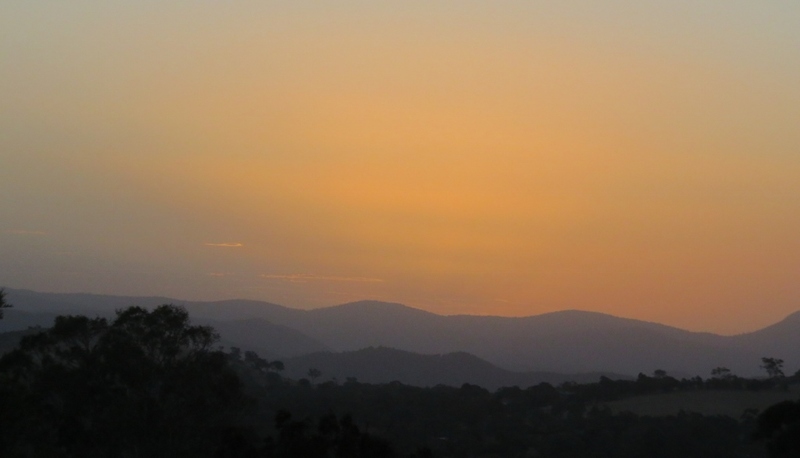 Finally the weather has cooled into the gentle golden sunshine that is autumn in Canberra, and often accompanied by beautiful sunsets.. 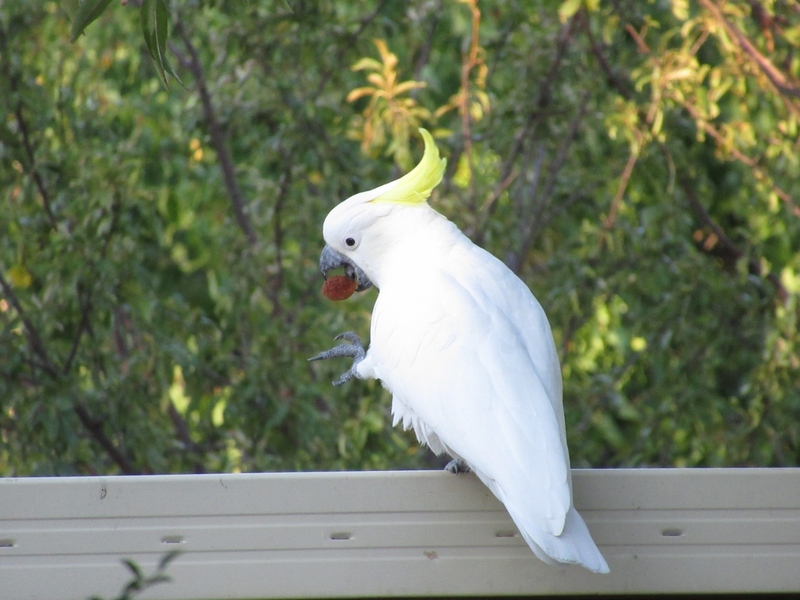 This entry was posted in Canberra's Suburban Gardens, Wildlife in the suburbs and tagged autumn, Corellas, gardening in Canberra, succulents, Sulphur Crested Cockatoos on April 28, 2018 by germac4.